From volcanolical perspective, the hazard of volcano classified in to two kinds: Primary hazard and Secondary Hazard. Primary Hazard is hazard directly caused by volcanic activity, example: Hot Cloud. While Secondary hazard is not directly caused by volcanic activity, example: Rain Lahar caused by the intense of rain fall.Are those hazard can be avoided and how? 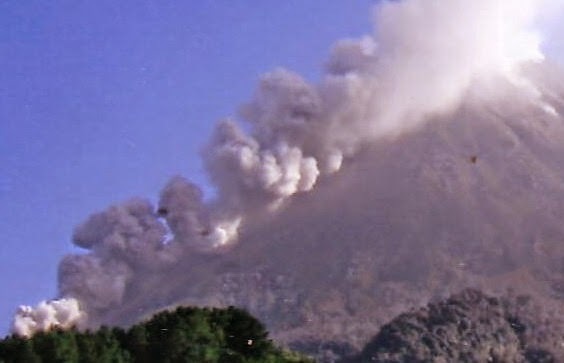 This danger is directly caused by volcanic activity.During explosion or increased activity of a volcano, volcanic material directly erupted:Lava Flow,eflata's and gas.Lava flows of Indonesian volcano mostly easy to avoid since the Indonesian lava streams are generally andesitic of composition thus highly viscous and moves very slowly. Big bombs only effect the direct surrounding of the crater which are normally uninhabited by people.This kind of danger is sometimes to be avoided by seeking shelter below or behind for protection such as big trees and rock found on the volcano's area. While Nuees ardentes, which is also well known as "Hot Cloud" and locally popular "Wedhus Gembel" specially around volcano Merapi, and generally Java, normally move very rapidly up to approximately 150 km per hour.This rapid move are hard to to be avoided except by evacution which is normally difficult to be done in quick respond.Volcanologist (Neumann van padang, 1975)defined Nuees Ardentes as a avalanche of heavy lava block rich in gases which rushes down the slopes of volcano.Based on volcano Agung eruption recorded in 1963, the avalanche may reach a distance of 15 km. This danger is not directly caused by volcanic activity but is normally due to rain falls after or during an eruption. The surface water flowing down the slopes of a volcano covered with ash and other loose other materials will add to the rivers which has their sources on the summit area heavy suspended material forming mud flows in the valleys known as Rain Lahars. Direction of the lahar may change: in a very short time a valley may be transformed in to a flat area, and otherwise may also happen within a couple of hours.This phenomenon of the change in the direction of lahar flow is very dangerous as it is generally unpredicted. Lahar may not necessarily form during rains but it is dependent upon the amount of water coming down within a certain time. Based on historical record of Rain Lahar of volcano Merapi in Yogyagakarta-central java:Dangerous rain lahar occurred when water coming down 77 mm within 35 minutes above the elevation of 1200 m.
To avoid the secondary hazard, hikers are not recommended to stay or walk by following the valley or river, even take cross the river heading summit of the volcano on intense rain fall.